First, I’d like to welcome all of our new subscribers to the Surat Naturopathic Newsletter – I hope you are able to make good use of the information found here. September is National 5-A-Day month – focus on establishing good dietary habits this month by including fresh fruits and vegetables in your daily meal plans. Just think about what you ate yesterday. With your breakfast did you have any fruit? With your lunch or dinner did you have any veggies? 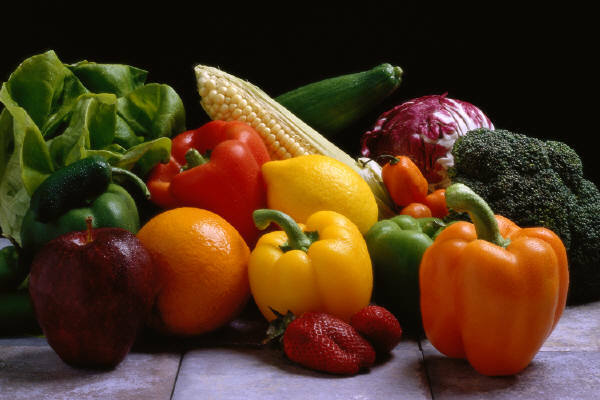 According to the USDA food pyramid we should be eating 3-5 servings of vegetables and 2-4 servings of fruits, daily. Not to mention the 6-11 servings of grains, 2-3 servings of dairy and 2-3 servings of protein. I don’t know about you, but for me that is a lot of food to try to eat every day. A report put out by the CDC states that on average only 14% of US adults are meeting the government’s goals for eating fruits and veggies. And their goal is the low end of the servings 2 fruits and 3 veggies. The CDC reports rank each state based on how well we are doing with eating our fruits and veggies. In California, only 16.1% of adults are eating the low standard of fruits and veggies. Unfortunately, our society is failing families. If only 16.1% of adults are eating their fruits and veggies, then what percentage of children are eating fruits and veggies? It is important that we all make health conscious decisions not only for ourselves but also for our families. The habits children see their parents doing are the habit they themselves will form in the future. How can we better feed ourselves and our families? Here are my top 5 tips to make sure you get in the fruits and veggies we all need. Plan out your meals. Spend a bit of time on the weekend to formulate each meal and remember to add in fruits and veggies. Grab a piece of fruit for an afternoon snack. Fruit is a wonderful way to end a meal; it gives you the sugar you might be craving. Tired of eating the same veggies? Pick a color and find a new veggie that is that color. If you have children, have them help you pick out a new veggie. Cut up the veggies – carrots, celery, broccoli or any other veggies – make them accessible to everyone in the family; they will soon grab the veggies over the chips.